Taking on the appearance of Hal, Q01 is sent to Kurumi's house in order to save her from her state of despair. As Hal returns day after day and increases his efforts, Kurumi, despite her initial reluctance, slowly begins to open up to him and break free from her depression. But there is more to Hal than meets the eye, and these two will soon learn an unexpected truth about this relationship between a human and an android. In the backdrop of a very slightly future world of helper robots and robot therapy a violent, fiery plane crash effectively ends the budding romantic lives of Hal and Kurumi. Left alone and without their significant other, Hal wakes up dazed and confused, programmed with a new mindset of a robot sent to comfort "his" former lover. Through their initially reluctant meetings and attempts to make Kurumi happy again, Hal finds something much more beautiful, and much more sad than what his initial purpose had programmed him for. Using various things left behind in that small button shop Kurumi lives in as clues, Hal does his best to simulate the former Hal as best as he can. Photo albums and short messages written on Rubik's cubes are his main ways of connecting to the now reclusive Kurumi. With each short exchange, they start to open up to one another, sharing in their pains of loss and memories of a once happy life. With each side of the Rubik's cube solved, each bearing a different message and a different color, everything culminates in a beautiful ending of growing closer to one another, no matter what the source. "Hal" is a short film that packs into it a myriad of emotions of love and loss that gives viewers glimpses of the lives of Hal and Kurumi before and after the plane crash. After shutting herself in her room, Kurumi seems to spend much of her time trying to fix a broken red video camera that taped moments of her and Hal's lives, some memories flattering and others painful. Seeing the past shows us that things were not rose colored and perfect, but sometimes troubled. Overcoming these obstacles and growing closer is the heart of this film. The story is like a puzzle, leaving us as confused as Hal at first. Through those disjointed recordings of the past, and as Kurumi fixes the video camera, these scenes become more complete and raise certain questions. Loose points and fuzzy details rise that do not seem to make much sense, but every little detail comes together brilliantly in a dazzling conclusion that reveals much about the story behind the story. It is like how the characters love solving Rubik's cubes, how with each completed face of the puzzle the overall picture becomes clearer, another message is revealed, and another beloved memory is remembered once more. It is a game of puzzles that leaves viewers playing the game with Hal all the way until the very end. However, not everything is fleshed out and not everything is made clear. There is a much darker side to "Hal's" world that the film hints at but never really goes into depth with. The only clue is Hal's hated memories of being poor and his experiences as a child. Given more time, the film could have created another aspect of the future world the characters live in to bring up more points about the conflict that robots bring. In fact, the robot aspect plays such a minor part that much of the film would be unchanged if they were suddenly taken out. Even so, this is a way for the story to bring in the interesting aspect of questioning what would happen if a loved one was suddenly replaced by a robot that looks exactly like them. The film is a visually pleasing swirl of colors and reflections, light and dark, old and new. The setting is gorgeous, with the sun shining and entering the lonely button shop that Kurumi lives in. Even though this story takes place in the near future, there are still traditional buildings, customs, and a festival parading through the modern town. The water illuminates, the trees shade the light, and everything seems to flow. The film looks very crisp and colorful. The most stunning scene, where everything ties together, is a wonderful display of fantastical light and reflecting waters. Accompanying the film is a pleasant soundtrack that accents the mood the film creates, that of hope and comfort, of regaining the past. The voice cast is excellent, with some of my favorites playing the characters. The ending song is Owaranai Uta by Yoko Hikasa, who plays Kurumi. It is a wonderfully bittersweet song that adds a sense of completeness to the film. All the way until the last note, viewers are still playing the game with Hal. "Hal" is an enjoyable, romantic story of finding the past and growing closer to one another. Accepting our flaws and less savory parts is another step towards love and understanding. It can end abruptly, it can end violently, it can end unfairly, but learning to move on afterwards and taking comfort in fond memories is our way to cope with the ever painful reality of loss. Just like solving a puzzle, solving each part and filling in the blanks, this story completes a picture of memories, both good and bad, of the precious time that we spend with our loved ones. What constitutes true love? The answer is simple. Working towards understanding one another and growing closer to each other through the process. Hal is not your typical romance show, but instead, strays from the norm by bringing touching on the post-romance theme, which seems to be taboo in anime nowadays. The setting of the story is slightly into the future, where robots and other more advanced electronics are common place. In a mere hour, HAL demonstrates the cycle of what was a regular relationship turned bad through the death of one of the two young love birds. The story centers around the main character, a robot who now takes on the face and role of Haru, as he tries to reach out to Kurumi, the latter whom has given up the will to live upon the passing of the original Haru. A touching story, astonishingly full of emotions despite its short length. The animation is relatively detailed, creating beautiful environments and bringing out the various emotions belonging to each scene. In particular, water appears to be a main focus of the show with it being used in various ways throughout. The background music acts as a great way to pull the audience deeper into the story, creating gripping scenes which do nothing but cause you to gasp in shock or smile along with the characters. The generally gentle music in addition fits very well with the theme of comfort and trying to regain the will to live. In this short span of time, a great deal of focus has been successfully put into showing the relationship between the characters. Haru, the robot desperate to learn more about Kurumi to cheer her up and Kurumi, the grief stricken ex-girlfriend who wants nothing more than to go back to the time when she and Haru were together. I had expected the characters to be rather shallow due to the time constraints of the movie but was pleasantly surprised to find that this was not the case, but rather, the opposite of what the anime managed to convey. I thoroughly enjoyed this movie as though rather short and could possibly be considered rushed, it still manages to very effectively make me feel along with the character and associate with their feelings. Though some things were left unexplained, in particular some parts from the start, it became apparent later on through self deduction as other truths were revealed throughout the anime. Definitely a good watch and all in all, a rather spectacular piece of work. This movie was a total disappointment in both characters and story aspects .The concept and idea was good but the execution and rushed pace made it worse. The story is about losing a person who is dear to you and the movie portrays the human drama behind that loss. The only problem is the execution of the plot and character interaction. The rushed pace that the movie uses , instead of making the viewer accommodate with the story and characters , all of the emotions and drama is lost on the way leaving no impact or message. The characters are poorly written , we can’t get to know them and understand their sufferings because the movie doesn’t tell us nothing about them. They are thrown into our faces and used as plot devices for the progression of the story. 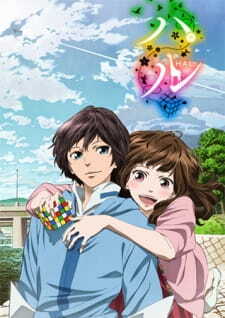 For example the relation between HAL and Kurumi who is the main focus in the movie , the execution and the way it’s delivered as a human drama aspect for the viewer, fails it’s expectations and potential.This happens because the movie doesn’t explore the characters background story enough, we are shown only pieces of the puzzle but those pieces are not entirely connected to the story or serve a purpose for the human drama theme. The transition between different aspects of the human drama is rushed and all of the emotions is lost . For example when HAL tries to help Kurumi and cheers her up , the anime doesn’t take a natural pace to form a bond between those two instead all happens in a instant and we are left with a lot of questions and a sour taste of disappointment. In conclusion I was disappointed in the execution of the story and plot because of the rushed pace, the poorly written characters who I couldn’t get to know them well both on story and emotional state , a lot of unexplained plot holes and finally the focus on the human drama aspect that lacked a strong impact and message to me as a viewer. Hal is a love story between a robot and a human. Kurumi had lost her lover, Hal, in a plane explosion. Since then, she had shut herself in due to depression. A doctor (and friend of Kurumi's), along with Hal's grandfather, get a robot to help Kurumi. The robot takes Hal's place, in appearance and name, and goes to reach out to Kurumi and hope to reforge a relationship between Hal and Kurumi. The art, done at Wit Studio (known now for Attack on Titan) is phenomenal in this movie (as you can see in the image). The scenery, the character design, and pretty much everything (especially the water) is beautiful in art and design. Kudos to you Wit Studio. Next up is characters. The characters in this were so lovable and genuine that you can't help but get attached. I don't know I mean there's not much else to say other than I loved the characters. Just to make a longer segment I'll put music here too. The music was fantastic and really sets a mood (as music should) that engulfs you into the story. Again... not much else to say there. Themes and Messages. The overall themes were really driven and important here. Things like "can you teach a robot to love" and "can you ever understand someone else's emotions" come into play and are really driven home hard. Along with a recurring motif of Rubiks Cube Wishes (what those are is that you write a wish on a Rubiks cube and if you solve it that wish will come true). You'll walk out of this movie asking a lot of questions like this, and maybe even have an existential crisis, like I did (even more than with Evangelion). The dub quality (I watched it dubbed) was amazing. Funimation does it again with a fantastic dub. That's all there is to say here. And lastly, the story. What could easily be the best part of the movie. Having only 60 minutes to deliver a story so powerful, so amazing, and so thought-provoking is truly a feat to be amazed at. I'm still in awe about everything in the movie, and the ending will have you thinking about this movie for quite some time (seriously, I'm even going to have to rewatch it). All I can say is that Hal is nothing short of a masterpiece, and all in the course of 60 minutes.